energy value was derived from TDNmaintenance using the NRC (1989) empirical equation in MILK2000 (Schwab et al., 2003). In MILK2006, the NEL-3x energy value is derived using an adaptation of the TDN-DE-ME-NE conversion equations provided in NRC (2001). Dairy cattle nutritionists have long used non-fiber carbohydrate (NFC) as a quasi-nutrient rather than starch specifically. However, NFC is a calculated value (100-NDF-CP+NDFCP-Fat-Ash; NRC, 2001) comprised of varying proportions of starch, sugar, soluble fiber, and organic acids, and is subject to errors associated with analyzing the five nutrients used to calculate NFC. Although the NRC 2001 summative energy equation was based on NFC, starch rather than NFC is being used in summative energy equations (Schwab et al., 2003) by many commercial feed testing laboratories especially for corn silage which they have long been analyzing for starch content and have developed NIRS calibrations for starch determination. However, determining digestion coefficients for starch to use in summative energy equations has been difficult. The NRC 2001 model uses an NFC true digestibility coefficient of 98% and arbitrary processing adjustment factors. The MILK2000 model uses a non-starch NFC (NFC minus starch) true digestibility coefficient of 98% (NRC, 2001) and varies the starch true digestibility coefficient from a minimum of 76% (Firkins et al., 2001) to a maximum of 98% (NRC, 2001) using whole-plant DM and kernel processing as regression equation variables to predict apparent total tract starch digestibility (Schwab et al., 2003). Both approaches though are limited in their ability for detecting potential variation in starch digestibility across a wide array of samples, and novel lab assays are needed. While these observations with MILK2006 are encouraging, more model validations relative to in vivo data are needed. The MILK2006 Excel Workbook can be downloaded at the University of Wisconsin’s Extension website. Table 1. Impact of IVNDFD (average lab IVNDFD 58% of NDF) in whole-plant corn harvested at 35% DM content with kernel processing on TDN1x (%), NEL-3x (Mcal/lb.) and milk (lb.) per ton using MILK2006 or MILK2000 with nutrient composition adapted from NRC (2001) for “normal” corn silage (8.8% CP, 45% NDF, 27% starch, 4.3% ash, and 3.2% fat). Table 2. Impact of “low” (45% DM, unprocessed, 8.8% CP, 54% NDF, 46% IVNDFD, 20% starch, 4.3% ash, and 3.2% fat) versus “high” (30% DM, processed, 8.8% CP, 36% NDF, 70% IVNDFD, 34% starch, 4.3% ash, and 3.2% fat) quality extremes in whole-plant corn on TDN1x (%), NEL-3x (Mcal/lb.) and milk (lb.) per ton using MILK2006 or MILK2000. Table 3. 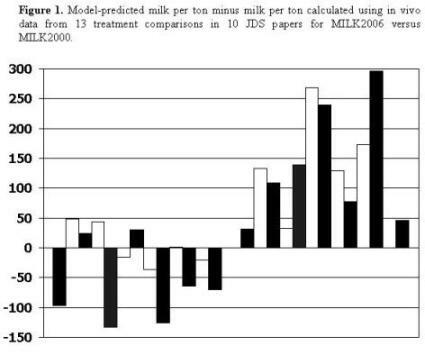 Analysis of correlations for selected corn silage nutrients and their digestibility coefficients with milk per ton estimates from MILK2006, 2000, 1995, and 1991 models (n = 3727 treatment means; Shaver and Lauer, 2006). 1Calculated as per Schwab et al. (2003) except for modifications discussed herein. 2Calculated as per Schwab et al. (2003). 3Calculated as per Undersander et al. (1993) except for in vitro DM digestibility adjustment. 4Calculated as per Undersander et al. (1993) using ADF and NDF. Firkins, J. L., M. L. Eastridge, N. R. St-Pierre, and S. M. Noftsger. 2001. Effects of grain variability and processing on starch utilization by lactating dairy cattle. J. Anim. Sci. 79(E. Suppl. ): E218-E238. Hoffman, P. C., Lundberg, K. L., L. M. Bauman, and R. Shaver. 2003. In vitro NDF digestibility of forages: The 30 vs. 48 hour debate. Univ. of WI Extension Focus on Forage Series. Vol. 5, No. 16. http://www.uwex.edu/ces/crops/uwforage/30vs48-FOF.htm. Lauer, J., K. Kohn, and P. Flannery. 2005. Wisconsin Corn Hybrid Performance Trials Grain and Silage. Univ. of WI Ext. Publ. A3653. http://corn.agronomy.wisc.edu/HT/2005/2005Text.aspx. Neylon, J. M., and L. Kung, Jr. 2003. Effects of cutting height and maturity on the nutritive value of corn silage for lactating cows. J. Dairy Sci. 86:2163–2169. Oba, M. and M. S. Allen. 1999a. Effects of brown midrib 3 mutation in corn silage on dry matter intake and productivity of high yielding dairy cows. J. Dairy Sci. 82:135-142. Oba, M. and M. S. Allen. 1999b. Evaluation of the importance of the digestibility of neutral detergent fiber from forage: effects on dry matter intake and milk yield of dairy cows. J. Dairy Sci. 82:589-596. Remond, D., Cabrer-Estrada, J. I., Chapion M., Chauveau B., Coudure R., Poncet C. 2004. Effect of corn particle size on site and extent of starch digestion in lactating dairy cows. J. Dairy Sci. 87:1389-1399. Taylor, C. C. and M. S. Allen. 2005a. Corn grain endosperm type and brown midrib 3 corn silage: Site of digestion and ruminal digestion kinetics in lactating cows. J. Dairy Sci. 2005 88: 1413-1424. Undersander, D.J., W.T. Howard, and R.D. Shaver. 1993. Milk per acre spreadsheet for combining yield and quality into a single term. J. Prod. Ag. 6:231 235.